This page is updated regularly with best selling and highly rated coffee machines that currently have a special offer. These deals sell out fast so make sure you don’t miss out on these bargain prices. *Please note: The prices shown are live prices but they are subject to change at any time. The Bosch Tassimo Vivy 2 in black is a 1300w fully automatic compact coffee machine and has an RRP of £107.49. With over 35 different drink varieties available as coffee pods/pads this is a very versatile drinks machine. The Bosch Tassimo has 0.7l capacity water tank, and is ready to make hot drinks from the moment you turn it on. Easy to use and easy to clean having dishwasher safe parts. It is a very compact capsule coffee machine so will fit in a small kitchen with ease. You can also buy the Bosch Tassimo Vivy in Red, and Cream. 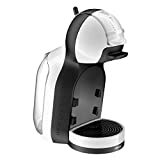 The Nescafé Dolce Gusto by De’Longhi in white and black is a popular coffee pod machine and has an RRP of £99.99. It offers over 40 varieties of hot and cold drinks with a 15 bar pump pressure for coffee shop quality coffee. The Dolce Gusto coffee machine is stylish and compact and the pods can be purchased from all supermarkets. It’s easy to use with a volume selector to tailor the length of the drinks to your own taste. You can also buy the Nescafé Dolce Gusto in red and white. 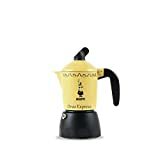 The quick and easy way to make Italian style coffee on your stove. The KitchenCraft Aluminium Coffee Maker holds 290ml of water and absorbs heat quickly producing 6 hot espresso shots in a matter of minutes (or a good mug if you prefer). Its suitable for gas or electric hobs with a heat resistant handle to make lifting an pouring safe and comfortable. This coffee maker is great value with an RRP of £13.95, but look for it on offer to make it even better value! The De’longhi Magnifica ESAM4200 in silver is a bean to cup coffee machine meaning it will grind your coffee beans with the built-in burr grinder and turn them into the perfect cup of coffee. 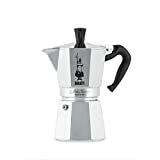 It boasts a 15-bar pressure pump for the perfect crema, along with a stainless steel milk frother. De’Longhi have a reputation for making high-quality coffee machines with this being no exception. It includes many useful features such as a dual boiler system, a brewing unit and drip tray that can be removed for easy cleaning, a cup warmer and a very handy adjustable height dispenser. This coffee machine is simple to operate with a one touch operation, and its very stylish to boot. With an RRP of £449.99 this isn’t one of the cheapest coffee machines, but it can often be found on offer – see below! The stylish Nespresso Citiz Coffee Machine has a very small footprint on your worktop and this red version will add retro style to your kitchen. This coffee maker has an integrated aeroccino milk frother to create creamy frothy milk for your coffee. It also features an automatic programmable water quantity for espressos or lungos, a thermoblock heating unit that heats water in seconds, and a powersave mode. 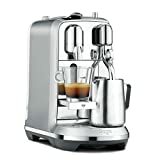 This highly rated coffee machine with an RRP of £209.99 also comes with 16 Nespresso coffee capsules for you to try out. It is also available in Silver. The quirky style of the Dolce Gusto Oblo coffee machine is very popular with coffee lovers. This black version by Krups has a 15 bar pressure pump for shop quality coffee with a great crema. There are over 30 varieties of drink that can be made with the Dolce Gusto and the capsules can be purchased in supermarkets and online. It’s very easy to use and keep clean, and has some great reviews. With an RRP of £119.99 it is a good value coffee machine that is often on special offer saving you a great deal of money to spend on coffee capsules! The Dolce Gusto Oblo can also be purchased in White.